The weather was calm with no waves no tide just slick as a Mirror, perfect for Black Bay. 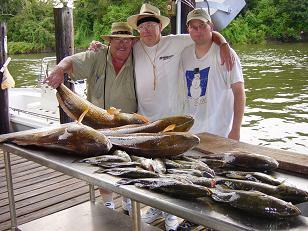 We stopped at several of my Hot spots we were using live Croakers on the bottom. Wham!!! 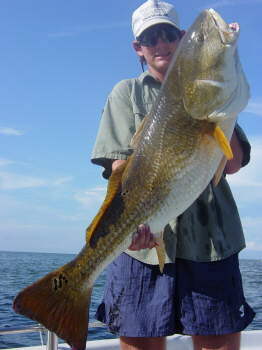 Gerard CASWELL was hooked up on Monster Bull Redfish!!! ZZZZZZZZZZZZZZ!!! Took out all of the line and then popped it. Later Gerard hooks up on a 4lb trout and we thought a 4' shark was about to eat it but it was not a shark, it was a Monster Bull Redfish!!!. A fe w minutes later Wham!!! Adam was Hooked up on a Monster Bull Redfish!!! after a 20+minuet struggling to keep him out of the rig he landed the BEAST, the Monster Bull Redfish!!! All of 43 Inches long and about 30+lbs, what a great Graduation Present. The line from Gerard pervious hook up was hanging out of the Bull Redfish mouth. Gerard and I both were impressed!!! This was one hungry Bull Red!!! Then it was on to Trophy Trout, from 3lbs to 4.5lbs. R.P. Fontento was hook up on a Monster Bull Redfish!!! ZZZZZZZZ!!! After landing the beast. As soon as he throughout RP Fontento was on another 20+minute fight struggling to keep him out of the rig he landed the BEAST, this was his second Monster Bull Redfish!!! All of 43 inches long and about 30lbs after landing his second Monster Bull Redfish!!! It was time for a beer and long break, he couldn't fish he was WIPED OUT!!! Break time or Pass out!!! 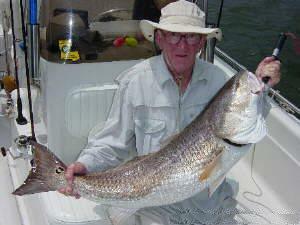 Barry Yokum was hooked on a 40 Inches Monster Bull Redfish!!! Weight in at 23lb 4oz. One Drag Screaming ZZZZZZZZZZZZZZ!!! of a 20 minute fight, in 2' of water!! !